Follow the bricks through the welcoming courtyard to this oceanfront charmer in the St. Simons village area. The river-recovered heart cypress front door is the first hint of the treats inside. 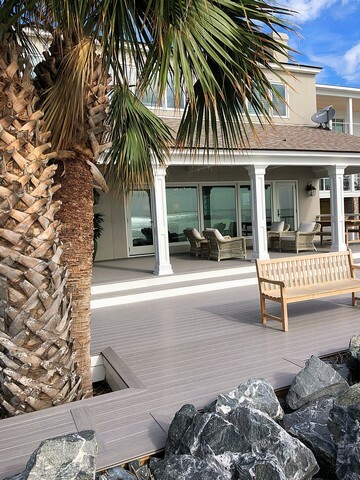 As you enter, your eyes are drawn across the beautifully restored original brick flooring to the wide expanse of glass ahead overlooking the St. Simons sound and the ship�s channel. This wall of glass is all hurricane -rated allowing the beautiful view to be enjoyed no matter what Mother Nature brings. In 1964 Hurricane Dora washed away two streets between this house and the ocean so this property then became oceanfront. With a 2017 update this homeowner has taken great advantage of the beachfront opportunity. An added mantle to the original fireplace ensures year round enjoyment. Fine antiques, Asian porcelains and antique Persian rugs throughout mix with light colors and fabrics for a modern sensibility. Quartzite counter tops with double molding give the kitchen a �dressed up� look while still allowing it to be very functional. The dual fuel stove and TV cabinet (which hides the TV when not in use) are just two custom touches which make this home an easy place to live. By the way�the laundry nook in this home is VERY well hidden�.see if you can find it! The master bedroom takes maximum advantage of the view. The spa-like bath features Diana Royal marble and showcases a classic Beatrix Potter collection. Upstairs, nautical items include a binnacle and a ship�s wheel from a WWII Liberty ship as well as a form of British art made of wool, called a �wooly�. 18th century porcelains add beautiful design accents in the library with a stunning view. Don�t miss this classic which is being shared with the Tour of Homes for a second time! 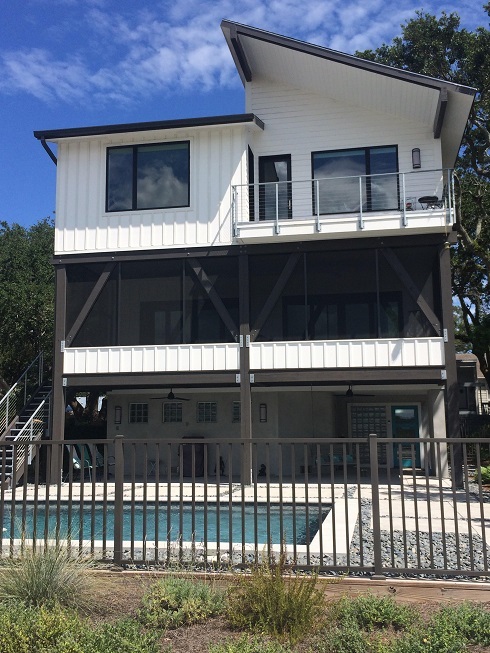 �Sophisticated beachy� best describes this full scale East Beach home. Behind the front door lies much more house than initially meets the eye. This 2017 design celebrates an open living space with soothing colors and 11ft. ceilings. Oversized custom furniture and fabrics with soft hues of white, blue and seafoam set a welcoming mood as you enter and give no clue that this house sleeps 16. White marble mont blanc countertops and a glass top table visually open the gourmet kitchen where no detail has been forgotten. A pecky cypress ceiling accents the lanai which also includes a fireplace for multi seasonal enjoyment no matter what the weather brings. The first floor master bedroom highlights a granite floor, oversized shower and a pool just out the back door complete with waterfall and outdoor shower. Be sure to notice the splashy artwork here!! Upstairs are three bedrooms and a bunk room with beds galore. The comfy sitting room here is central to all of the ensuite bedrooms while also providing a gathering area with a small balcony. This arrangement is ideal for social times while at the same time connecting all of the sleeping spaces, providing privacy as well. Don�t miss the octopus! This was done by a friend of the homeowner and is a special treasure for her. In the nautical themed bunk room, each bed has its own USB port. 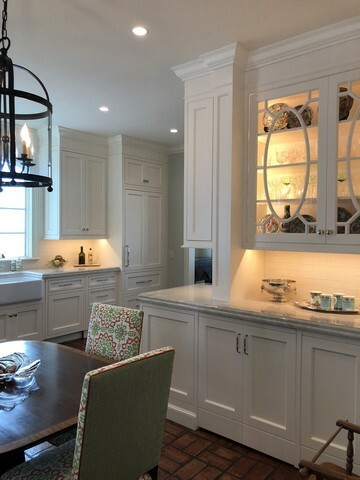 This room features ship design lights and portals while boat cleats serve as handles for the drawers. With a small playroom/ reading nook oﬀ to one side this is a kids� dream room! The Enchanted Cottage is enrolled in a local rental program�� so check your calendar, grab your beach towel and get your crowd together. The sun and the waves are calling!! 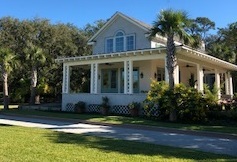 This recently finished contemporary home overlooks the wide Marshes of Glynn on the west side of East Beach. The hardscape out front is the first suggestion of the unique features here. Just inside the front door, the elevator features original artwork by the homeowner�s grandfather. Collections and memorabilia from career travels mainly in South East Asia accent every room. This �environmentally forward� design includes wide passageways with no floor thresholds, lots of glass to let in natural light, LED lighting where it is needed, open cabinet fronts in the kitchen and the use of only handles on the drawers (no knobs). All showers are handicap friendly and all plants are herbicide free. The entire home is centered on �aging in place�. The owner has proudly placed several pieces of art from both her father and her grandfather, oils and watercolors, in this comfortable space. 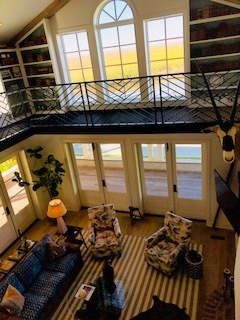 A long and welcoming balcony connects the master bedroom upstairs with the guest room for sunset watching across the marsh. Asian fabrics and design touches complete the look for this relaxed, easy setting. Two things not to miss: the �wall of fame� showcased in the upstairs oﬃce and the surprise artwork hanging in the upstairs landing. Both are very special and make this home one not to be missed! What a treat! This generous family has already shared their main house with the Tour of Homes twice before and now they are welcoming us to their new guest house. Perched on a beautiful bluﬀ overlooking Dunbar Creek and Hawkins Island, this fabulous site complements the main house beautifully. Lush landscaping leads you past the first �tree spirit� to the potting shed with the unusual stone fragment over the door. This unique piece was intended for a floor labyrinth at Grace Cathedral in San Francisco. The open lawn to your right actually has a labyrinth planned in its future. Follow the path to the courtyard full of blooms and up to the expansive wrap porch made of thermal ash. The inside flooring is made of old world weathered ash. Step inside and be greeted by a Wildebeest on the floor and a Gemsbok mounted watchfully over the fireplace. Don�t miss the �paper book� wall piece and the �newlywed chimes�, just two of the most unusual design touches. Oh yes�and there are two �Gogo� sconces which have been electrified over the spiral staircase. 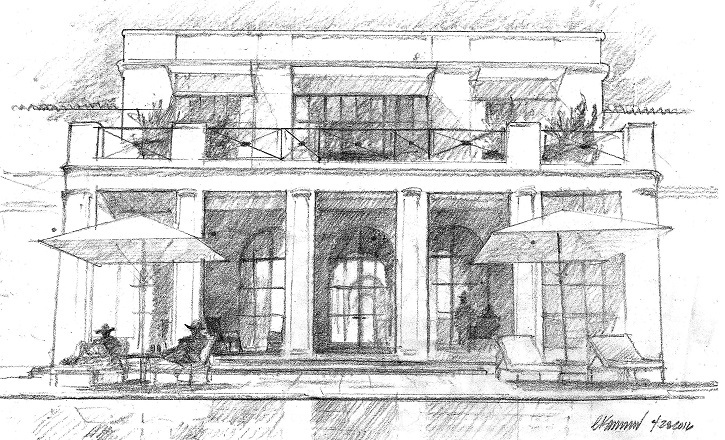 Additional design touches are reflected by the custom ironwork. This warm and welcoming one bedroom house with sleeping loft is the perfect place for extra guests or family and oﬀers to both homeowner and guest both the closeness and the privacy they might wish. 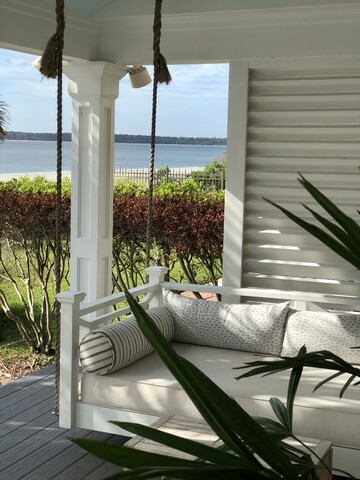 With another �tree spirit� outside carved in a towering oak and a pair of carved pelicans on the dock, all watching over the creek, this just might be the perfect place to enjoy the sunset from any of the swings. Be on the lookout for the dolphins which cruise this creek often! 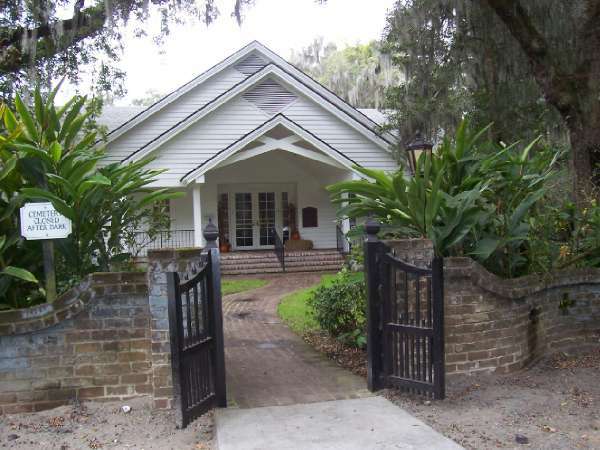 The Historic Harrington School House, formerly known as the Harrington Graded School, was built in the 1920s and served as the main educational structure for three African American communities on St. Simons Island. 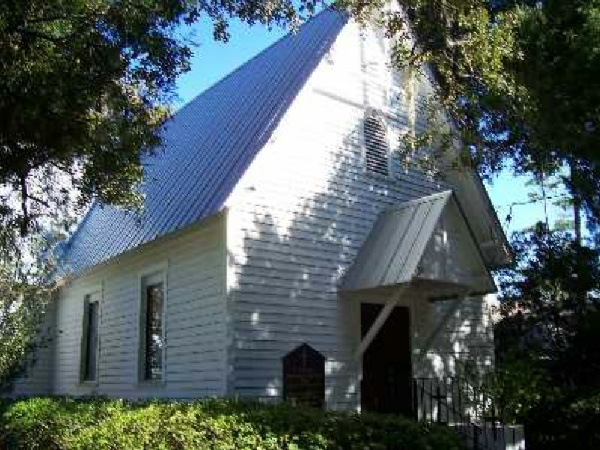 It hosted grades 1-7 until desegregation in the 1960s when students left to attend St. Simons Elementary.. 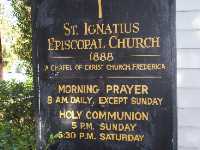 In 1968 it was converted to a day care center and used for this purpose until 1970. It was largely abandoned after that and sat unused for decades. 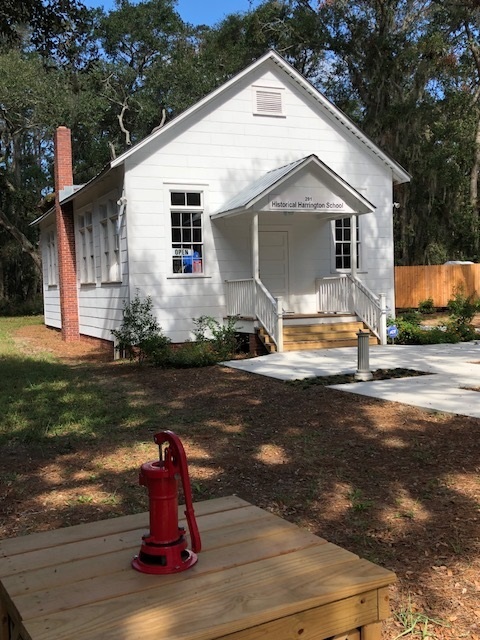 To preserve the one-room historic Harrington School House Mrs. Isadore Hunter donated her portion of heirs property land to the St. Simons Land Trust and Glynn County in 2004. 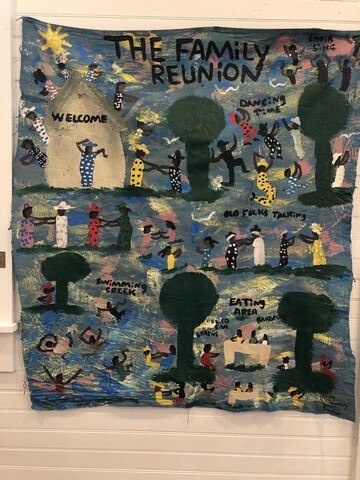 Since 2004 the St. Simons African American Heritage Coalition, in partnership with The St. Simons Land Trust, has been active in the fundraising, restoration planning, management and operations of the School. The actual restoration of the School began in 2010 with an overall restoration cost of $325,000. The School officially re-opened with a ribbon cutting in August of 2017. 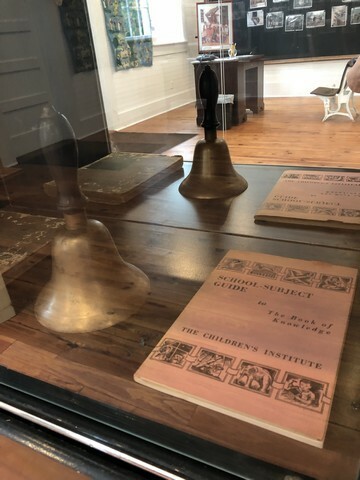 Over the years, the school house was much more than just a place to learn. The community gathered here for Halloween apple-bobbing parties in the fall, plays and covered-dish dinners, and visits by Santa and Christmas exchanges. In the spring, there were Easter activities, the plaiting of the Maypole, the prom and graduation. Community organizations such as the Harrington Parent-Teacher Association and the Harrington Civic Club also utilized the building for meetings and fundraising events. Hamilton Plantation, owned by James Hamilton, a native of Scotland, was located on Gascoigne Bluff. 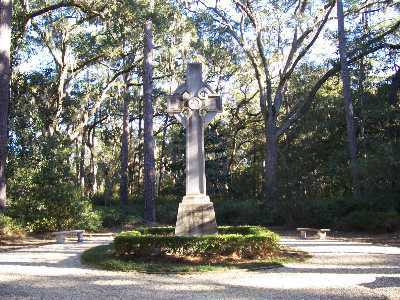 The Bluff was named for Captain James Gascoigne, Commander of the British sloop �Hawk,� which brought General Oglethorpe to St. Simons Island in the early 1700s. The Bluff became a storehouse for marine supplies, ship repair facilities and, in effect, was Georgia�s first naval base. Hamilton Plantation (late 1790s) was a working plantation producing long-staple Sea Island cotton along with oak and pine timbers. Of the long row of tabby slave cabins built near the plantation house during the early 1830s, two remain today. They were constructed of tabby, which is a concrete-like mixture of lime, sand, water and oyster shells. The cabins were divided in the center by a wall and fireplace creating two rooms that housed two families. 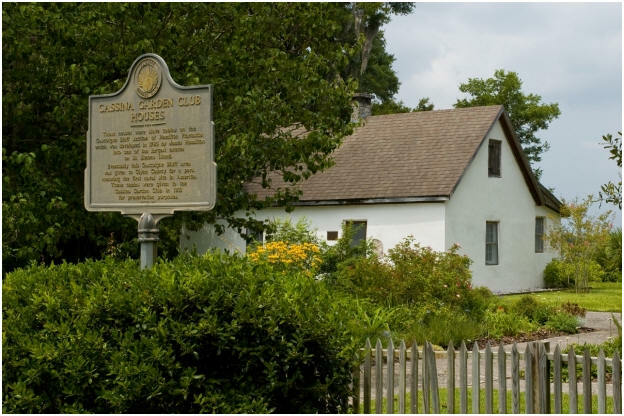 The slaves who lived in these cabins were likely the house slaves. Cassina Garden Club began meeting in these cabins in 1932 and was deeded the property by the county in 1950. Cassina Garden Club has just completed a historically correct restoration of their cabins, one as it was in the early 1830s when it was constructed and the other as it was during the �Mill Days� of the 1870s to the 1920s. 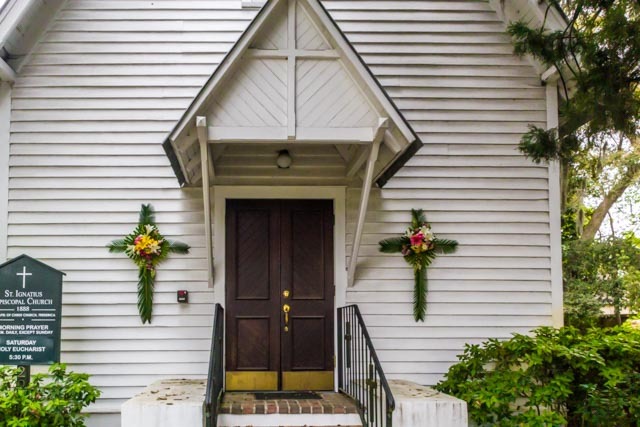 Not surprisingly, this beautiful property was placed on the National Register of Historic Places in 1988 by the U.S. Department of the Interior. Built on the model of a Havana Town Mansion, this is one masterpiece of design and fabrics. You will enter through the two story foyer, the loggia with its stucco groin vaulted ceiling, the courtyard and the hall leading into the kitchen. First notice the custom bronze cooktop hood and the double edged quartz counter top on the island, just two of the special touches in this marvelous setting. The conservatory with breakfast seating aﬀords a most breathtaking view of the morning sunrise over the Atlantic shore. All the windows throughout the house are either bronze or bronze -clad and these windows highlight this feature clearly. The oceanfront lanai overlooking the pool is accented by a fabulous cypress ceiling. Watch the birds swoop and play as they look for breakfast! The grand salon awaits eight for dinner while conversation continues around the limestone fireplace. The study with its hand-milled pecan walls showcases both exquisite draperies and an unequalled marble fireplace while the bar is a most popular gathering spot. The powder room features a fabulous Merian Palm wall covering. Note how it fully wraps the doors for a most unique eﬀect. The grand staircase and intricate iron railing lead up to the art gallery serving as a hallway to the media room with its stepped ceiling. What a fabulous view from here! Belgian oak flooring leads to the master suite, a place of respite and relaxation. The mosaic tile inlaid with sea life brings a bit of whimsy to this oasis where the tub has its own fabulous thassos marble niche overlooking the tranquil ocean. A cool glass of champagne, anyone? The master bedroom with its private balcony features one of the most spectacular settings of all. �Gray Cashmere� walls against soft oyster cream fabrics establish a serene tone for settling in with a good book beside the shell stone fireplace. Down the hallway two more bedrooms with fabulous fabrics complete this wonderful tour. 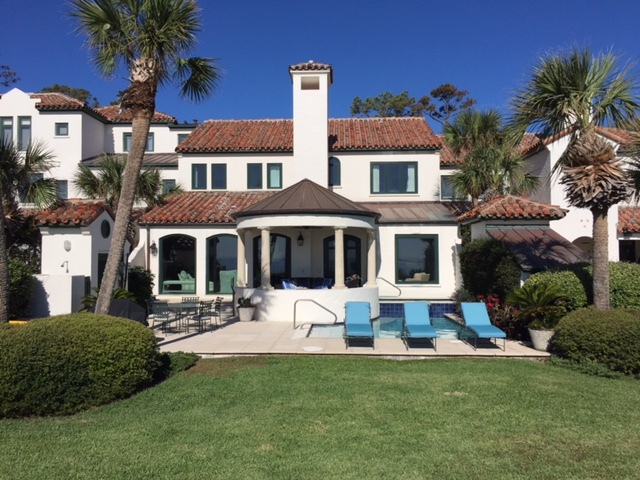 Generations of this family have returned to Sea Island and gathered joyfully here for good times. Since 1945 they have built treasured memories on the beach. This fabulous oceanfront home is an artful blend of the past and its special memories with a new emphasis on the present and a fresh look to the future. Recent remodeling has transformed a sparsely used downstairs space into a lively three bedroom living area that welcomes children, grandchildren and friends of all ages. With an additional three ensuite bedrooms upstairs there is assurance that a life-time of Sea Island memories will continue. Family antiques and heirloom pieces blend seamlessly with updated colors and redesigned room spaces to meet today�s living style. 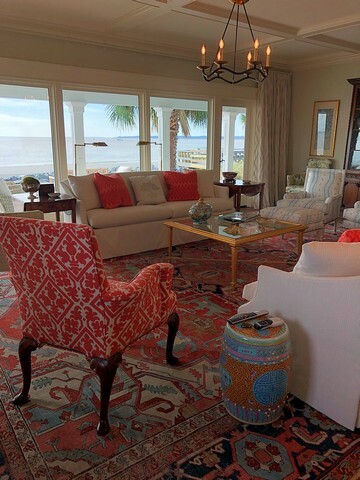 Fresh, durable fabrics and bright colors enhance a living area that now boasts large picture windows allowing in more natural light while also bringing the beach panorama visually closer to enjoy. A quiet library also now benefits from a greater ocean view while not sacrificing its smaller, more quaint gathering space. Notice the fabulous fireplace surround by one of our very popular local artists. This is a collector�s item, indeed. Other works by local artists have been collected through the years and are showcased throughout the home. 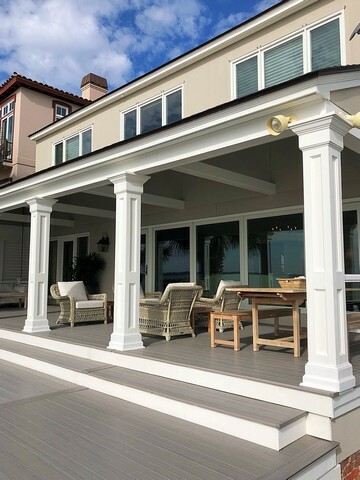 The outdoor living space includes updated fabrics and rugs chosen to withstand the demands of active grandchildren, beach sand and hours of entertaining by the pool and spa. Just steps from the private beach access, this is the site of long summer days. 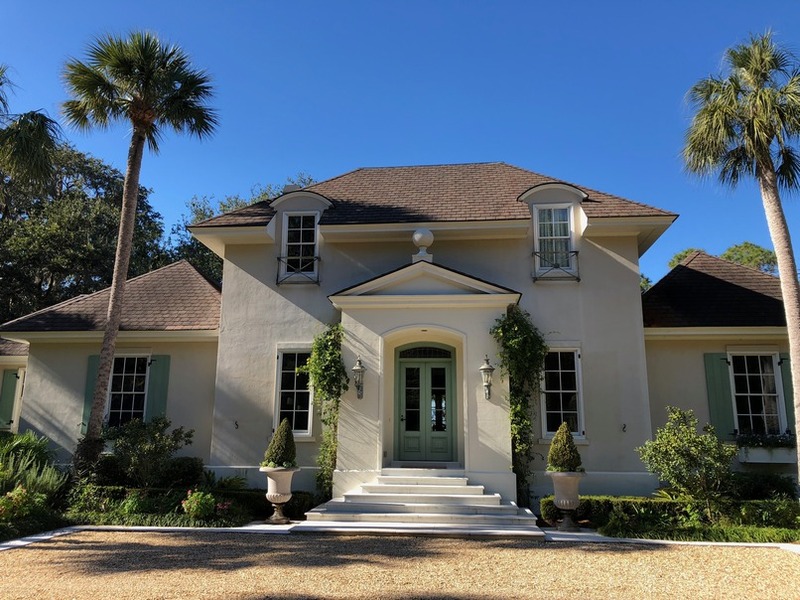 Originally built in 1998 and remodeled in 2017, this home is a classic example of the amazing results that can be accomplished when talent and foresight come together to celebrate the traditions begun years ago while assuring many more years of memory -making to come. This majestic beauty is full of unique design features and fabulous fabrics. For starters, the entry floor is hand painted. Just to the right is an alcove leading to the dining room. These walls feature �faux bois�, or a fake wood look- except this is not a wallpaper- this again is hand painted- complete with molding to give the appearance of panelling. Follow the hand planed walnut flooring into the stately dining room with its grand circular dining table. The living room fabrics enjoy the mixture of soft azure and oyster tones. The pillows on the sofa were hand painted to match the exquisite floral pattern on the chair in front of the fireplace. The oriental screen above the fireplace discreetly hides a TV when it is not in use. The desk across the room is an unusual mid 1800s Swedish design. Please notice the �bread cabinet� which has found its place as a piece of wall art�a very unique touch! Follow into the kitchen/ sitting area and see if you can find the cabinet with the date it was made painted on the drawer��.another very unusual find. What a lovely place to enjoy that morning cup of coﬀee! The homeowner�s love of the colors of nature comes full circle in the master bedroom and bath. The beautiful mural which adorns the walls of the bath bring the beauty of nature inside and the colors are carried out once again in the fabulous fabrics in the bedroom and on the bed. Three beautiful bedrooms upstairs complete the tour of this magnificent home. Enjoy the view from the pool out back with scenic view across to the river. A beautiful chippendale �trellis� and railing greet you as you enter this 3 story town home. This �trellis� eﬀect softens the corners of the doorways leading to the great room which has it all! Notice the placement of the �faux bois� wallpaper in the foyer giving the illusion of a paneled room. The bench here is a family heirloom and upholstered in a beach house cotton. An oyster shell and driftwood mirror combines with the travertine floor to give this home a breezy island feel. A baby grand piano stands in a sunny nook. Through the doorway the kitchen anchors one end and the living and dining areas the other. Designed for family gatherings and many grandchildren, there is ample space for cooking, relaxing, watching TV and family meals��.all in one! The tufted banquette is covered in faux leather making it very �kid friendly�. Just beyond the chocolate brown lacquered bar is a light filled sun room where chartreuse grasscloth covers the walls. The chair and accent pillows are covered by a turquoise and white toile. Faux tortoise wallpaper adorns the card table. Upstairs four well appointed guest bedrooms each have their own color scheme: peach (with its own great balcony), green, turquoise and the bunk room. With its bright colors this bunk room is a place any boy or girl would love. On the third floor the master bedroom is a true oasis accented by the cloud blue chosen here. Blue striped wallpaper, the upholstered headboard along with custom monogramed bedding and the beautiful rug are just some of the lovely details here and throughout the home. 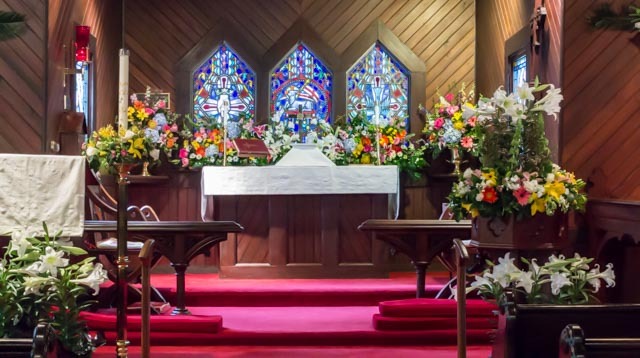 Notice the detailed work of the scalloped trim curtains here. And don�t miss the homeowner�s original artwork over the tub in the master bath. This charming town home is a must see! !